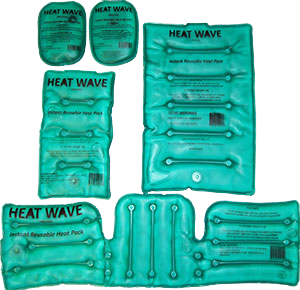 Our heat packs are designed to fit, comfort, warm, and heal every part of your body. 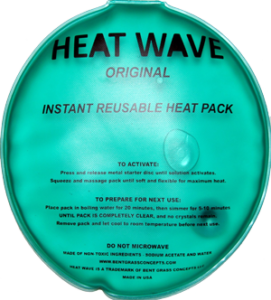 We have 2 styles of Hand Warmers – Heat Wave Original (3 x 5”) and new Heat Wave XT – Extra Long Lasting (3 x 6”). Our instant hand warmers are great pocket warmers for cold days, but also great to keep hands warm for carpal tunnel pain and arthritis, Raynaud’s disease, as well as for warming generally cold hands. 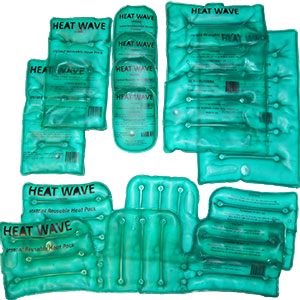 The medium and large rectangular instant heat packs can be used for: Ankle, calf, knee, thigh, and back pain, as well as general muscle soreness or menstrual cramps. Linear indentations in the hot packs allow the units to adjust to your body part. 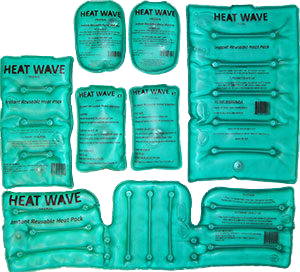 The round instant heat packs are long lasting heat packs for the most versatile uses. These are perfect for large pocket warmers or mufflers, pain relief for sore muscles and menstrual cramps, and for camping and survival applications. Heat Wraptor Heat Wraps make you and your heat packs mobile, by letting you wear them for extended periods of time, offering hot therapy relief for sore backs, knees, small joints, or bruises and sprains – for packs up to 5 x 10 inches long. 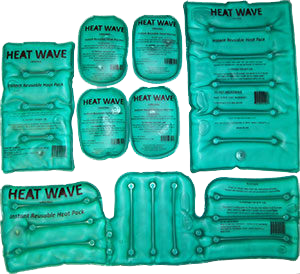 The universal back / neck / shoulder instant reusable heat pack is excellent for back, neck and shoulder discomfort. The slits in the pack make it ideal for a conforming fit, especially when worn on the lower back. Units heat up by squeezing a button in the pack, then turn from liquid to solid. They last from 1-2 hours depending on size, but are reusable 500+ times. Reactivate by boiling in water for 15+ minutes. No waste, environmentally safe.